I’m sure you’ve heard the buzz around Beautycounter. Whether you are familiar with them from their Target collaboration a few years ago, or you have a friend who has signed up as a consultant, it’s pretty hard to have not heard about this brand. But incase you haven’t I’m here to give you the DL. During my stint as a beauty and wellness buyer, I tested and was introduced to countless beauty, wellness, clean beauty and personal care products. From natural deodorant paste, to charcoal toothpaste…I’ve tried it. I poured myself into researching the next “it” brands and trends. During this time, cleaner, safer beauty and personal care products were on the rise. I was bombarded with all of the facts about the importance of reading labels ad seeking out cleaner products, because your skin is your body’s largest organ. So, whatever you put on your skin is being absorbed (yeah, scary). Obviously, being so close to the industries trends, I was familiar with Beautycounter and the work they were doing to bring awareness to cleaner, safer personal care products. However, it wasn’t until recently that I finally tried Beautycounter – and here’s what I think. First, for those of you unfamiliar with this brand, I should share a little backstory. Beautycounter is a B Corp beauty and personal care company who’s mission is to get safer products into the hands of everyone. Okay, remember when I said earlier that your skin is the body’s largest organ? Well, did you know that on average 64% of what you put onto your skin is absorbed into your body and bloodstream? Here’s where it gets even more real. More than 80,000 chemicals are on the market today – many without safety data, especially those chemicals used in the skincare and beauty industry. The FDA allows beauty and skincare companies to use these chemicals that are known to be harmful in products we use everyday. The scary part is, many of us are unaware there are harmful ingredients in our everyday products, which overtime can lead to serious health issues. Enter, Beautycounter. 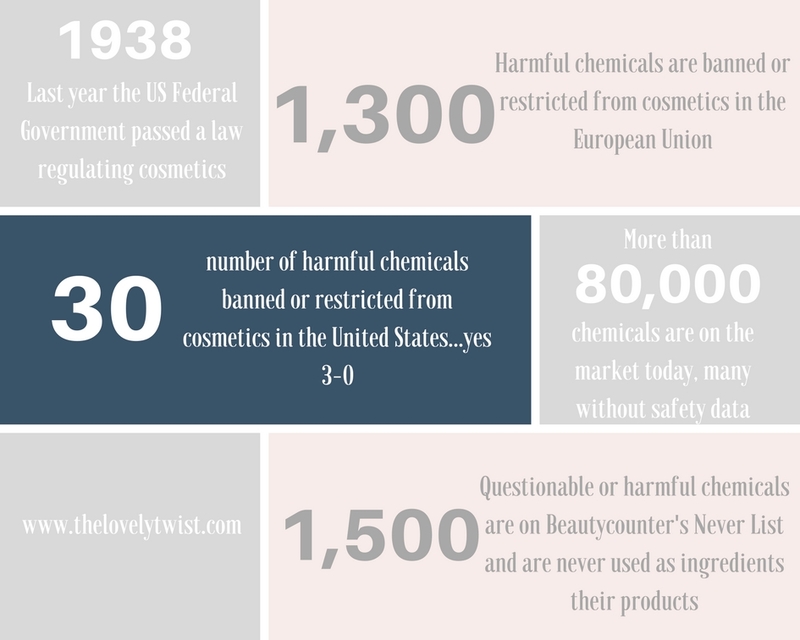 Beautycounter has what they refer to as a “Never List.” This list includes more than 1,500 questionable or harmful chemicals they never include as ingredients in products. I know what you’re thinking…”I tried a natural product and it was awful!” Along with their mission to bring safer products into our hands, Beautycounter does not skimp on quality or effectiveness. Beautycounter ensures their products perform and are as “indulgent as any other luxe shampoo, lipstick, or oil in the market.” I can vouch for this. The handful of skincare products I’ve tried from Beautycounter have been extremely effective. I’ll admit, I was skeptical of Beautycounter at first. Working with so many different beauty brands in the past, and keeping on top of all the “latest beauty trends” makes me no stranger to”green washing.” Greenwashing is when a company uses PR tactics to clean up their image, presenting a cleaner look to consumers. For example, a company might change packaging to position themselves as caring about the environment and put forth a safer image. But, this company is still using known harmful chemicals in their products. Slap a green label on a bottle of toxins and it looks more appealing if you don’t know any better, right? Beautycounter has made a commitment to safe ingredients, vs pushing the whole greenwashing image. You won’t see Beautycounter over-pushing buzz words like “organic” or “all natural.” And truthfully, you should educate yourself on the products you use that do make these claims. Using words like “natural,” “organic,” or “cruelty free” might make a product sound safer, but the sad reality is these items can still have harmful and toxic ingredients. For example, a company can use 95% organic ingredients in their body cream. If a harmful toxic ingredient makes up 1%, they can still call the item “certified organic.” I’m scratching my head because this does not seem right! After doing a lot of my own research and reading up on Beautycounter’s ingredients, I’ve actually been very impressed by this company’s transparency. Beautycounter is not 100% organic, nor do they claim to be. They are upfront about their mission to use only non-toxic ingredients. If you read up on their FAQ page, you may be surprised at how much info they do share. 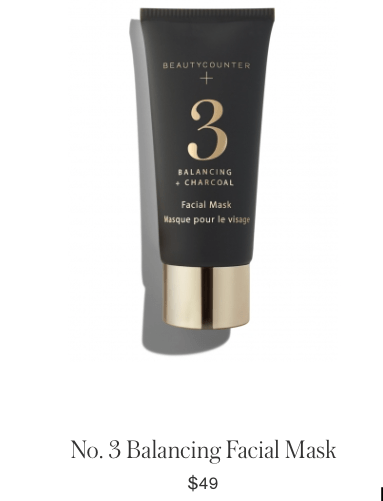 Beautycounter is upfront that they do at times use synthetic ingredients, and trace levels of a chemical from the never list could make it’s way into your products. However, they’re passionate in working hard to ensure the synthetics used are safe, non carcinogenic or harmful to your overall health. Having Beautycounter be upfront about this info, makes me feel 100% confident in trusting them. Okay, back to our regularly scheduled programming…my thoughts about the Beautycounter products I’ve tried. I finally broke down and tried this brand after Kerri, a sweet “e-friend” I made through following one another on Instagram reached out to me. Kerri is a consultant for Beautycounter [shop her site here], and follower of The Lovely Twist (thanks, girl!). She reached out in the sweetest, non-pushy way (also, thanks girl!) – just sharing her passion for the company and its mission. I’m so glad Kerri reached out to me, because I’ve fallen in love very quickly with these products. I happily sampled some Beautycounter Nourishing skincare items, the Balancing Charcoal Face Mask, and No. 3 Balancing Face Oil. The Nourishing skincare items were effective and gentle while my skin was breaking out. This line left my skin feeling clean and moisturized. Next, the No. 3 Balancing items. Yeah, talk about a hero products if I’ve ever seen em. First, the Balancing Facial Mask. This gem of a product uses nutrient-rich kaolin clay activated charcoal to minimize the pores, leaving your skin smooth. The mask also has salicylic acid, which helped in exfoliating and clearing up my skin. Next up, the The No. 3 Balancing Facial Oil. I’ve been a huge fan of facial oils for quite some time now. I love going to bed with my face all moisturized up, it helps me wake up with brighter, even skin. This facial oil, has easily surpassed all of my long-time tried and trusted brands. I’m obsessed. The balancing facial oil is lightweight, smooth, and smells ah-may-zing. It’s made up of 7 different natural oils that work together to smooth, clam, and help even skin tone. This oil helped in areas I was breaking out and evened out those pesky dark marks that come with acne. There you have it! My honest experience with Beautycounter thus far. If there’s one thing you take away from this post, I hope it’s the knowledge of pursuing safer ingredients. Unfortunately, our government does not regulate the ingredients of personal care products to the degree in which they should. We are not being protected from harmful chemicals that have been known to cause health issues. Time to take your health into your own hands. Go after, and research brands like Beautycounter. Start making safer swaps today! If you want to read more about Beautycounter or shop their amazing products please visit www.beautycounter.com. I’ve tried their body oil and liked it a lot but felt it used too quickly for the price. I know a lot of people are Beautycounter reps which makes it seem a little too Tupperware party for my liking but they do seem to have some good products! Thanks for reading and sharing your experience! I have not tried the body oil, only the face oil – which truthfully the small sample size has lasted me over a month! The products of Beautycounter’s that I’ve tried have all seemed to be really concentrated and I don’t find I need a whole glob of moisturizer for it to do it’s job…which I like! I will admit, I was also offset by the rep program and Beautycounter being just “another MLM.” Having said that, I fell in love with their mission, and everyone I’ve come across who is a consultant has not been pushy at all! Thanks for sharing this information! I’ve been asked to either sell Beautycounter or purchase it and while I’ve been looking more and more into finding cleaner products, I’m just gonna be frank here, Beautycounter is expensive. I understand that it probably cost a lost to make these products and to make these products as clean as possible, I always feel like the prices tend to be higher than the products who aren’t trying to be as transparently clean as possible. Kudos to Beautycounter for leading the fight for more regulation in the beauty industry, but I do wish it were a bit more affordable so EVERYONE could purchase and benefit from their products. 1. Beautycounter products are like the Chanel of safer personal care products. I certainly cannot afford to swap my entire cabinet with Chanel, but I’m putting my health at risk by not making some swaps. Their products are made with safe, sustainable, ethically sourced ingredients AND packaging, so they are doing it the right way which sadly means a higher cost to produce. 2. By leaning on more affordable beauty products we are continuing to support the very systems of injustice that are making it hard for safer products to be affordable. By continuing to buy my once go to mascara with Formaldehyde and formaldehyde-releasing preservatives because it’s cheap I am padding the pocketbooks of CEOs who want to do things the cheap way, not the right way. Unfortunately, change is unlikely to happen until the large corporations feel a drop in sales or until companies like Beautycounter are able to push for better regulation of ingredients in personal care products.